The air ejector draws out the air and vapours which are released from the condensing steam in the condenser. If the air were not removed from the system it could cause corrosion problems in the boiler. Also, air present in the condenser would affect the condensing process and cause a back pressure in the condenser. The back pressure would increase the exhaust steam pressure and reduce the thermal efficiency of the plant. A two-stage twin-element air ejector is shown in Figure . 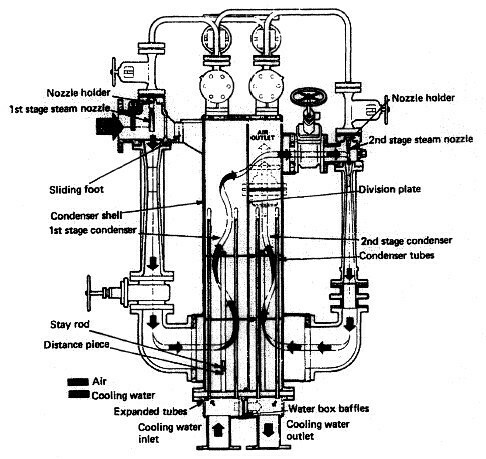 In the first stage a steam-operated air ejector acts as a pump to draw in the air and vapours from the condenser. The mixture then passes into a condensing unit which is circulated by feedwater. The feedwater is heated and the steam and gases are mostly condensed. The condensed vapours and steam are returned to the main condenser via a drain and the remaining air and gases pass to the second stage where the process is repeated. Any remaining air and gases are released to the atmosphere via a vacuum-retaining valve. The feed water is circulated through U-tubes in each of the two stages. A pair of ejectors are fitted to each stage, although only one of each is required for satisfactory operation of the unit.